Patti wrote: I would have made that correction last night, but when I looked closely at your drawing on the negative, it isn't clear that you have only drawn on the ridges, so I let my comment stand. At what location do you think that I have not followed the ridges in the 'reversed' picture? PS. If you decide permanently not to correct your statement about my lines in the 'reversed' picture... even while you now know that your statement is not correct at all... then that would become a clear example of that in your approach, afterwards you are even able to 'read' your own mistakes... as 'valid comments'. And if you continue with this approach towards your own mistakes only, then you appear to create a 'phantasy-world of assumptions' where your can put any element 'upside down' at any moment in time... whenever it suits you. In fig. 232, as Kiwi already pointed out, there can be seen at least 1 ridge (red) making a complete circuit (as a spiral). ... And??? What is your point? 1 - First of all, I observe that likewise 'circuits' can be seen in Kiwihands' example - see for example the picture below. 2 - And second, I should add here immediately that [u]the issue of the 'complete circuit' ONLY relates to the assessment of a 'whorl'[/u].... so I don't understand why you are now using the issue of a 'complete circuit' as an argument to use again my assessment for 'central pocket loop'. So Patti, can you please explain why you are using this argument... or are you just... ( ) ... 'thinking out loud'??? You really should read the rules yourself before posting. The central pocket loop type of whorl has two deltas and at least one ridge making a complete circuit, which may be spiral, oval, circular, or any variant of a circle. ... I don't mind admitting that I made a mistake regarding the 2nd point that I made earlier in this discussion (see the red words above), but in the first point I had already explained that there a 'complete circuit' visible - because the 'S'-shape belongs to the category of a 'spiral' or 'circle variant'. So, I completely mis-formulated there my second argument... instead I should have mentioned that because of the first point that I made, the aspect of the 'complete' circuit becomes simply irrelevant for both the 'plain whorl' and the 'central pocket loop', because while it is found in the definitions of both the 'plain whorl' and the 'central pocket loop'... is is also visible in Kiwihands' example! "The central pocket loop type of whorl has two deltas and at least one ridge which makes or tends to make a complete circuit." And Kiwihands' example also meets the other major requirements mentioned in the definition... "
... And of course I should have mentioned in my later comment (see above) as well that it was actually my first argument (see my former post) that made the issue of the 'complete circuit' irrelevant - because... a 'complete circuit' IS present in Kiwihands' example (manifesting as: a 'whorling ridge' + the 'S'-shape). my version of the FBI book must be a different edition different from yours, and in its definition the "tends to" is missing. Instead it just says "The central pocket loop type of whorl has two deltas and at least one ridge making a complete circuit, which may be spiral, oval, circular, or any variant of a circle." I assume my edition is older than yours since I downloaded it for free from Project Gutenberg, and I'll amend the definition. Great to hear that my 'summarizing comment' became very helpful for you, and your comments sounds like you made significant progress in understanding your 'central pocket loop' example. PS. I am using a 1998 version of 'The Science of Fingerprints'. The Project Gutenberg version says "Release Date: August 10, 2006"
"The central pocket loop type of whorl has two deltas and at least one ridge making a complete circuit, which may be spiral, oval, circular, or any variant of a circle." I didn't know an S shape can be described as a variant of a circle ...can it? Lynn wrote: The Project Gutenberg version says "Release Date: August 10, 2006"
Don't you think that a "S"-shape (which typically manifests in the 'grooves') can be recognized as a 'spiral'-variant? - See for example the illustration of a 'whorl' below. I hope it make sense for you now? 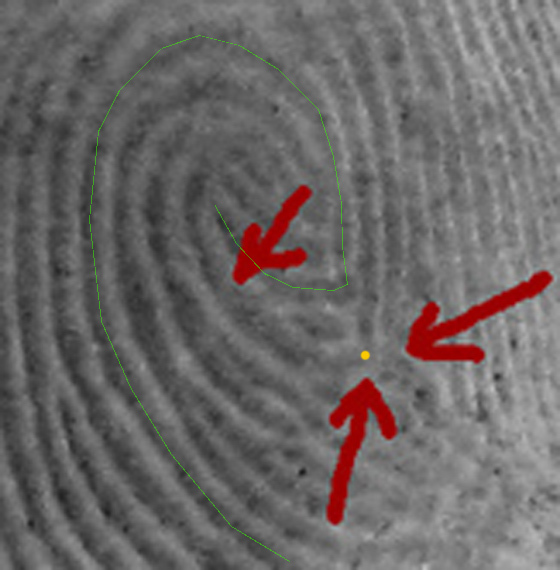 Has nobody heard about the little or small double loop as a fingerprint? It is a variant of the double loop. The little double loop has the same qualities as the normal double loop, dependent on which finger. Are you referring to the very core of the whorl pattern where sometimes it's a tiny spiral, sometimes concentric circles and sometimes a double loop, but we are only able to see this pattern clearly in the very center? I have whorl fingerprints and the extreme central portion of the different prints vary. Yes, it is a little double loop in the center of a normal loop. A central pocket loop or peacock's eye is what these have been called. I think it's important that the central pattern be contained. The guidelines state that when you draw a line from one triradius to the other there should be a complete pattern above this line that is contained. I've seen this rule stated various ways. With concentric circles it's easier to find a contained circle or pattern, but with the double loop, the ridges unwind and tend to cross this drawn line between the triradii. Then the rules become more complex (as you can see from the earlier part of this discussion). Also, if it has 2 triradii, it's a whorl of some sort. I know what you mean but still it is not a central pocket loop or peacock's eye? I know it is very difficult. But when you follow the ridge in the middle than you get a very small double loop in a normal loop. Sometimes the rules are too stricted, you can make it so difficult as you want. But never mind, you can see what you want. When it is to difficult explain it as an usual loop. Nice to see you participating in the discussions again! By the way, have you noticed that Lynn, Patti & me are usually discussing the details of fingerprints with the F.B.I. book 'The Science of Fingerprints'? Magda van Dijk-Rijneke wrote: I know what you mean but still it is not a central pocket loop or peacock's eye? I know it is very difficult. But when you follow the ridge in the middle than you get a very small double loop in a normal loop. Sometimes the rules are too stricted, you can make it so difficult as you want. But never mind, you can see what you want. When it is to difficult explain it as an usual loop. I agree with you in the respect that rules can be limiting. The FBI rules are good for classifying the patterns, but they narrow them down into too few of groups for use in palmistry. Personally, I think the essence of a person with a big double loop filling the fingertip pad is very different from someone with a smaller double loop inside a 'pocket'. 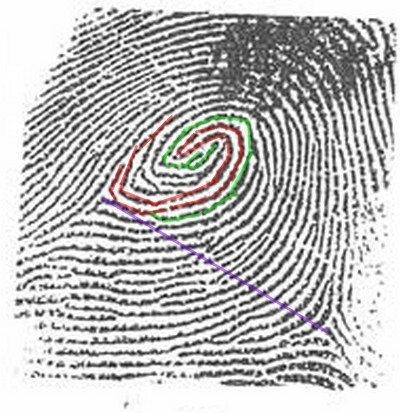 Purkinje, who first identified and categorized the various fingerprints divided them into 9 categories which the FBI has narrowed down to arches, loops and whorls with subcategories plus the odd prints that don't fit in just one category. This is basically related to triradii. Arches with 0, loops with 1 and whorls with 2 or more. Purkinje also in the early 1800's stated that he thought every subjective state related to an objective state. The FBI is primarily concerned about accurate and repeatable identification and not a person's objective and subjective states of being. Thank you Patti and Martijn fore your explanation, this is interesting! I have downloaded that famous book and now I going to study it. But now..., what is in your oppinion the qualities of character of that accidental loop .